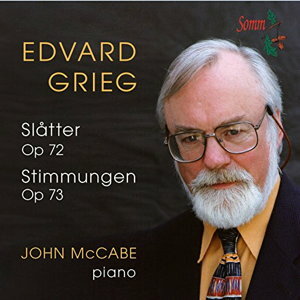 The story of this recording is a fascinating one, but then equally so is the story of the writing of Grieg’s Slåtter Op. 72, otherwise known as Norwegian Peasant Dances. These folk tunes and dances were the inspiration of generations of folk performers on the instrument known as the hardanger fiddle. Around 1888 the hardanger fiddle player, Knut Dale, of Telemark, became concerned that this wonderful heritage was likely to be lost, and wrote to Grieg suggesting that these traditional, often improvised tunes should be written down, to save them for posterity, for like most of the traditional folk fiddle players he didn’t read music. The tunes were played by ear, and passed down between the generations. Grieg admired, and was influenced by Norwegian folk music, but it was not until 1901 that he arranged for a violinist friend, Johann Halvorsen, to note down painstakingly some of these intricate and highly decorated tunes, so that he could make piano transcriptions of them. He took great pleasure in this work, and was sad when the Peasant Dances didn’t really find favour among the cultured classes, and so were little performed. John McCabe had been most anxious to record this fascinating music, but it seemed impossible to get hold of a copy, until finally, by sheer chance, he found a tattered old copy in a second-hand book-shop in Lichfield, near Birmingham, priced at 20p. It is from this copy, still marked with all his fingerings, that this recording was made, and placed with RCA Gold Seal records, whose A & R Manager at that time, Robert Matthew-Walker, was, and is, a Grieg devotee. However, RCA were suffering with problems at their new LP pressing plant, and although well-reviewed, the surface noise on the LPs caused the recording soon to fall out of the catalogue. Following the success of the Nielsen Piano Music reissue on Somm at the beginning of 2015, I searched out the Grieg tapes, and found them in a sad state of age and disrepair. They needed careful and loving restoration before the recordings could be reissued, but thanks to Martin Nichols and Paul Arden-Taylor they have been successfully transferred to CD, and are now available again, coupled with Grieg’s Stimmungen, Op. 73, his final collection of solo piano pieces, which were recorded at the same time. The CD, SOMMCD 0154, has been released in December 2015, some 37 years after the music was first recorded, and the sound on this reissue is amazingly good.